More healthcare organizations are increasing their use of HIPAA compliant SaaS cloud services. This trend is juxtaposed with the need for patients to be accurately identified from any provider location. RightPatient® Global Connect lowers costs and creates single, unique, global patient identities that are secured with biometrics, effectively helping to reduce the challenges of patient data matching and data sharing across disparate health networks. 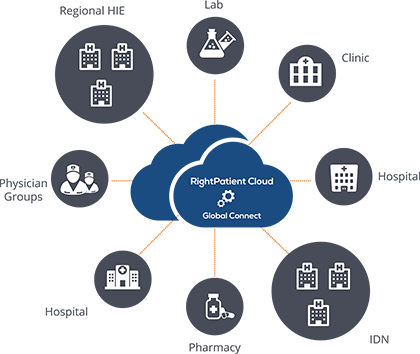 RightPatient® Global Connect is a HIPAA-compliant, SaaS biometric matching system that creates a federated patient identity so that patients can be accurately identified from any location. Through partnerships with IBM and leading credit agencies, RightPatient® Global Connect cleans a provider’s existing Master Patient Index, assigning a unique key to each patient identity and medical record. Registrars quickly and easily attach one or multiple forms of biometrics (e.g. fingerprint, iris, vascular) to the RightPatient® Global Connect patient record through an intuitive web interface. From any location with access to the RightPatient® Global Connect, patients can be accurately identified through a real-time biometric search, helping to prevent the creation of duplicate medical records and increasing patient safety. Using a powerful back-end architecture, RightPatient® Global Connect can quickly and easily scale as patient enrollments grow to retain optimized performance and reliability.